The scheme has been designed to be as natural as possible and respects and works with the existing natural floodplain. It is not a concrete channel. It is not an ‘on/off’ channel but a passive design which allows the natural floodplain to carry more water when needed. Most of the excavated area will be planted with vegetation and provide valuable new habitat for the area. It is designed to increase the capacity of the floodplain to carry more water. The Oxford Flood Alleviation Scheme will not increase flood risk to properties downstream of Oxford. The scheme does not hold back water (like a flood storage scheme) nor does it speed up water (like a deep narrow channel could do). We conduct detailed modelling, which is always independently verified, and this shows the scheme will not increase flood risk to properties downstream of Oxford. In addition, the Vale of White Horse District Council also commissioned a completely independent review of downstream impact. This was published in December 2017 and confirmed that the scheme will not increase flood risk to downstream properties. We will be removing the existing culverts and their metal railings, shown below and will install a new bridge in their place. The existing Willow Walk track is already raised above Hinksey Meadow. The new bridge will continue from this track, just raised slightly higher, and will span 19 metres. The height of the deck of the bridge will be approximately 1.5 metres above the existing footpath. The bridge needs to be this size to allow flood water to pass underneath it. 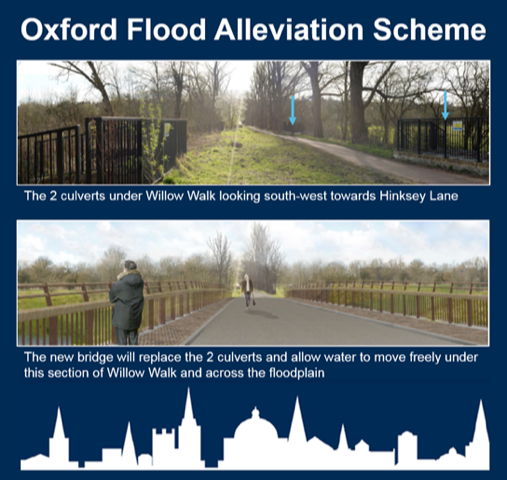 We recognise the importance of Willow Walk as an historic route and a key east-west link for pedestrians and cyclists into Oxford City. Access will be needed for occasional maintenance vehicles. We have confirmed previously that there are no plans to turn Willow Walk into a road. If the scheme is approved we believe it will help to safeguard the Green Belt in this area as it will need to remain as a functioning flood alleviation scheme for at least the next 100 years. This will help to maintain and preserve the openness of this part of the Green Belt. The natural design for the scheme includes the creation of over 20 hectares of new habitat. The scheme aims to bring a long term green legacy to the area. The scheme will have a long term maintenance plan for the lifetime of the scheme, 100 years. This includes managing the vegetation in the area by grazing. The ‘second stage’ wider part of the channel has been designed to be grazed by cattle to create floodplain grazing marsh. Temporary fencing and removable barriers will allow the second stage channel area to be grazed. We will also create many wetland features within the second stage channel to maximise available habitat for wetland and aquatic species. The backwaters, scrapes and ponds will have a variety of depths, dimensions and gradients, to encourage diversity of wetland wildlife. The new flood alleviation scheme does not divert water away from Seacourt, Bulstake and Hinksey Streams. The scheme lowers the existing natural floodplain so that in the event of high flows it can carry more water. In the Hinksey Meadow area, the existing Seacourt Stream will act as the first stage channel. A Materials Management Plan has been submitted as part of the planning application. This plan explains the options we considered for both the management of the materials excavated as well as the options for transporting the material from the site. There are no plans to use North Hinksey Village to divert traffic or transport materials. We will construct a haul road specifically for construction traffic within the scheme area to reduce the need for lorries to drive on local roads to access different areas of the site. However, we will be removing a large amount of material which will need to remove from site. Lorries will leave the site via a new compound and access road at South Hinksey and join the A34. This will be our main compound and access point onto the road network. The majority of the material being excavated will be alluvium, a silty clay. We will reuse this material in the proposed flood embankments where possible. Excavated gravel will be re-used in the scheme for environmental improvements and on the channel of the new river bed. Most of the material leaving the site will be transported to old quarries and will be used to restore these sites. Once planning permission for the scheme has been granted we will be able to confirm which sites have the capacity and necessary permissions to receive the material. To mitigate for the estimated 2,000 trees that will need to be felled during construction, we will be planting 4,325 trees. Approximately 15,000 smaller tree species, such as hawthorn, hazel and elder, will also be planted, along with many more native shrubs such as dogwood, goat willow, dog rose and wild privet. The tree-planting proposals result in more woodland within the scheme area after completion, than there currently is at present. These woodland areas will be managed for wildlife and include glades that are sown with wildflowers to encourage butterflies and other insects, as well as birds and foraging bats. The replacement woodland trees will be saplings and it will be many years before they have the same ecological value as those being felled, so throughout the design process, our contractors, engineers and ecologists have worked together to minimise tree loss wherever possible. Once a contractor has been appointed we will work with them to further minimise losses of mature trees wherever possible. The contractor will also protect all retained trees and hedgerows within the scheme boundary by erecting stout fencing before materials or machinery are brought on site and before any work starts. The Environment Agency is committed to the scheme bringing additional environmental benefits beyond reduced flood risk, and this includes our consideration for the trees and wildlife across the scheme area. Dredging the River Thames would not significantly reduce flood risk to Oxford. Even if we dredge all the channels that currently exist in Oxford, it would not reduce flooding from a major flood. In many cases, dredging isn’t the best long-term solution because rivers can quickly silt-up again. It can even increase flood risk downstream, alter the ecosystem, be environmentally damaging, costly and disruptive. Studies have indicated the River Thames would require frequent re-dredging as the natural tendency of all rivers after dredging is to deposit silt and return to their more natural dimensions. And it would not be a cheap option to dredge the River Thames.